Materials That can be Etched:- Iron, Stainless Steel, Mild Steel, Carbon Steel, etc. We are successfully meeting the varied requirements of our clients by providing the best quality range of Electrolytic Marking Machine. We are providing framed stencils for proper accuracy & registration for marking process. We are providing general zig-fixtures in a manually operating stand to make the printing process very-very easy so that an unskilled worker can operate. We have latest 2015 series of manual electrolytic marking systems. 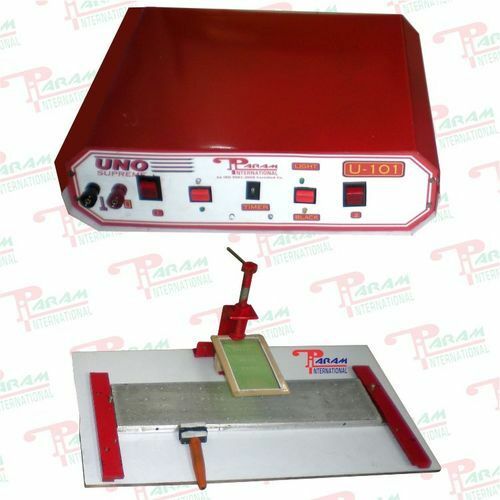 Incorporated in the year 1995 as a Sole Proprietorship firm at Jalandhar (Punjab, India), we “Param International” are a leading name that has been fulfilling varied needs of the clients by manufacturing a commendable array of Marking Systems, Engraving/ Cutting Systems, Industrial Printing System, Stamping Systems, Drying Systems, etc. These products are highly appreciated for their elevated durability, high performance and easy maintenance attributes. Under the leadership of our mentor, “Mr. P.S. Bedi” (M.D. ), we have gained a huge success and market share in this industry.